The module has a pre-test mode, which is used to activate the Test mode through the front panel emergency button, control the wind speed switching and heating/cooling valve, and automatically exit after 15s. The control of the valve is air/heating/refrigerating relay NO/NC control, 2 or 4 tubes are selectable, the mode can be switched by the use of the CHVAC series temperature control panel, and the mode can also be controlled by the bus device (mobile device, touch screen) Switch. Mode status feedback, CHVAC series temperature control panel and bus devices can synchronize valve status. The module has 3 speed control: automatic, low speed/medium speed/high speed. With the CHVAC series temperature control panel, the wind speed can be switched manually/automatically. The manual/automatic mode of the wind speed can also be switched via commands such as the bus device (mobile device, touch screen). The room management system (HRMS) can be visually and centrally managed. The data of each channel in each module can be uploaded to the room management system for module data management and status analysis. The software can also be set/configured via the touch panel. Scene management is to pre-set the time for the module through the HRMS, and then open the corresponding scene mode, to open all or part of the module loop. The fan coil module HRMS-FC5/10 is used to control the heating, ventilation and air conditioning equipment. It can control the three-speed fan and the cooling and heating electric valve. 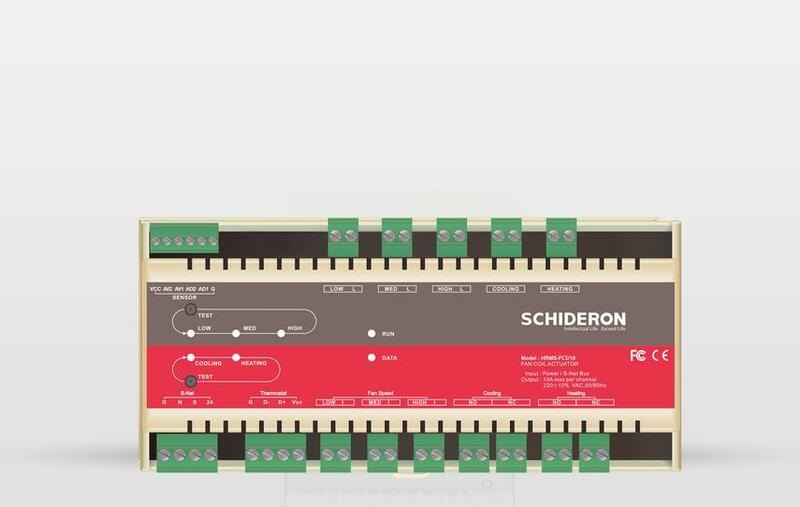 This module supports two- and four-pipe air conditioning systems and can be connected to single-speed to three-speed fans. . With 2 passive inputs and 2 analog inputs, it can be used to connect window magnets to detect energy and save energy. It can be used with the CHVAC series temperature control panel or a third-party thermostat. The module has a built-in bus coupler. It is mounted on a DIN rail and is connected to the system equipment via a bus connection terminal.